Materials belonging to Benjamin (Pap) Singleton consisting of business and family correspondence. Included are letters from two daughters living in Tennessee. There is also a letter of recognition from Kansas Governor John St. John written in 1879. 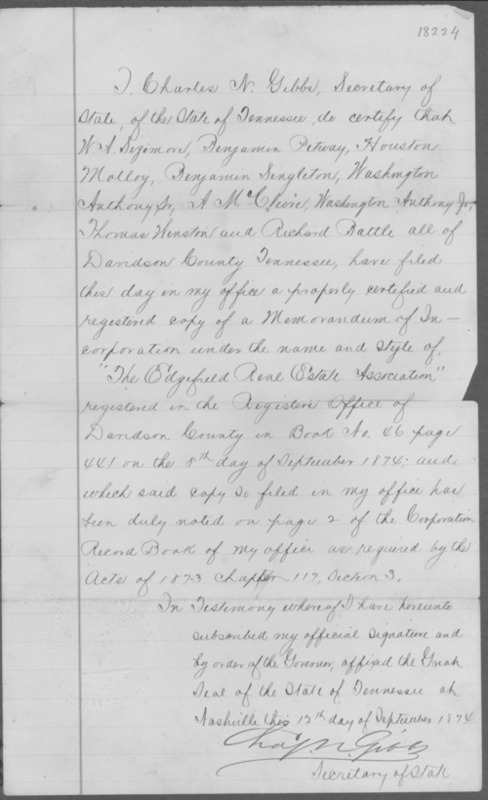 This folder also includes the deed for the Dunlap property, incorporation papers for the Edgefield Real Estate Association, the Singleton Colony, and other business records relating to the Dunlap Colony. Minutes of the meeting of the Singleton/Dunlap Colony beginning on pages 46 and 52 include listings of the colonists. The document beginning on page 52 also includes the number of people in the family and the number of acres of land they had. A first person account of why Singleton became involved in colonization begins on page 55.